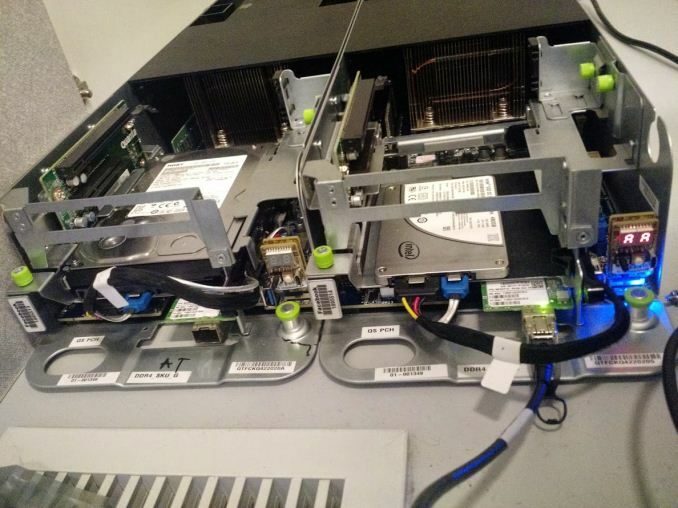 Four years ago we reviewed Facebook's self-designed and open source server, Freedom. Coinciding with releasing their datacenter design, they founded the Open Compute Foundation, creating a home for the design documents, licenses and bringing vendors together under one roof. Today, the Open Compute Foundation is doing well. Many high profile companies such as Yandex, IBM and Intel are members, and in 2014 Microsoft joined the initiative as a second major open hardware partner; releasing its Open Cloud Server designs to a pool of open hardware spanning everything from servers and switches to datacenters. The international community has grown substantially, with Summits in all major continents attracting a larger crowd each time. More so, the number of companies adopting hardware from OCP and contributing back is rising as well, and with good reason: Mark Zuckerberg indicated at the 2015 Summit in San Diego that Facebook achieved a $2 billion (USD) cost reduction (! ), achieved in part by using open purpose-built hardware instead of regular proprietary gear. When Facebook talks about the incredible amounts of money it has saved by using Open Compute, keep in mind that even though the vanity-free hardware is designed to be cost-effective, it's the actual software that enables hardware efficiency. The company has always sought to use commonly available software components to build its services, and when it picked one, plenty of time and money are spent on performance engineering to optimize the software. Performance engineering that enables Facebook to handle 6 billion likes, 930 million photos and 12 billion messages every day, and those numbers only represent activity its social network product generates; Instagram and WhatsApp are not exactly toy workloads either. Facebook has carried out plenty of improvements in open-source projects, or started new implementations, most of them contributed back to the community, good karma indeed. Notable performance-related projects are HHVM -- short for HipHop VM, a JIT'ing PHP virtual machine with its own PHP language dialect called Hack, adding static typing in the mix. HHVM is advertised as 'a more predictable PHP', and if Wikipedia's migration serves as any indication it makes existing PHP powered sites quite a bit faster as well. Another initiative called rocksdb, implements a properly scaleable, persistent key-value store for fast storage written in C++ and presto, a distributed SQL engine for Big Data stored in common storage systems like Cassandra, JDBC DBs and HDFS. Presto provides functionality similar to Hive, and is currently in use at Dropbox and Airbnb. Increasing the number of parts used in your systems exponentially increases the amount of money and time that will be spent in procuring, validation and maintenance. And keep in mind that in order to avoid vendor lock-in, each configuration must be available from at least two suppliers, so it's easy to imagine why FB prefers to keep it simple when it comes to servers: 5 SKUs using the same base platform, each targeted at a certain kind of application. 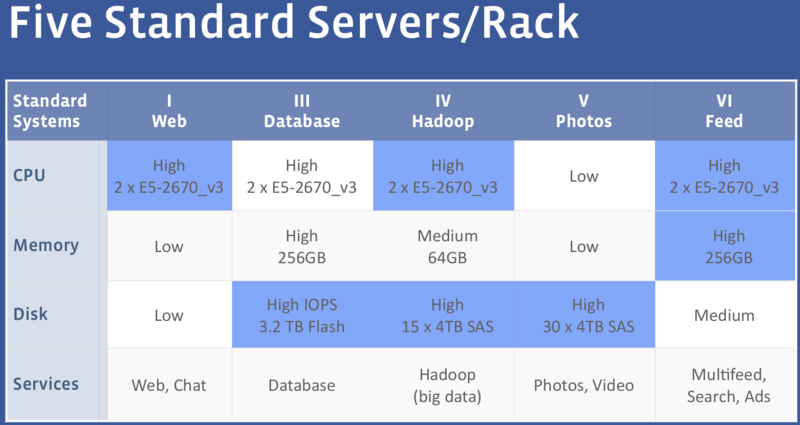 The SKUs mentioned are variations on Facebook's latest Xeon E5 server platform, Leopard, reviewed in detail in this article. The web tier is concerned with gathering every piece of information from the entire stack and rendering it to HTML/JSON, for which it needs a decent CPU, but not much else. Object storage, like photos is quite the opposite, and requires just a simple CPU (Atom C2000) to serve object from a large storage backend. At the other end of the spectrum, you have the data crunching units that require a decent chunk of processing power, memory capacity and I/O. Telcos have done this at -48VDC for a while. I wonder did data center power consumption get too high to support this, or maybe just the big data centers don't have the same continuous up time requirements ? In the submarine cable industry (your internet backbone), ALL our equipment is -48v DC. Even down to routers / switches (which are fitted with DC power modules, rather than your normal 100 - 250v AC units one expects to see). Only the management servers run from AC power (not my decision), and the converters that charge the DC plant. 48 v allows 4 times the power at a given amperage. 12vdc doesn't like to travel far and at the needed amperage would require too much expensive copper. and especially their 380V DC white paper. Indeed, HP already makes 277VAC and 380VDC Power Supplies for both the Blades and Rackmounts.